Hi Guys, I am Nihal Rebello and I have joined the Inddiethumpers in 2006. 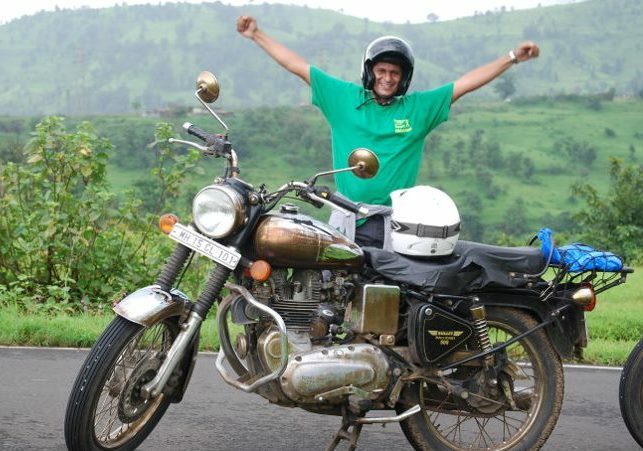 My biking experience started when I took spin on my grandfathers Bajaj scooter at the age of 14. Post that I have ridden other bikes like Hero Honda’s, Yamaha’s and others, which we call them as plastics have gone through my hands. I also had an RD 350 which now I regret selling off, wish I could turn back the hands of time. I always wanted to own a Royal Enfield since I was a little boy. The sound of the bike always made my head turn to see the bike. Still happens now and the obsession about the bike has grown. I always envied the Inddiethumpers since I started riding my plastic at the time. Living in Bandra gave me access to see the Thumpers line up their shining machines on Carter Road and stand proudly chatting and enjoying the evening on Sundays. I always knew that one day when I get my hands on my Royal I wanna join this club. Did not know much at the time about rides and the Thumpers. As years went by I got myself a second hand Royal Enfield 350. The bike initially looked sad, rusted and pathetic getting wet in the rain in a garage. After getting the bike in working condition and after many mechanics I reached Vinod and met some of the thumpers there doing their bikes. I met Sachin (Anna), Hemal and Rohan along with Vinod who also rode with the club. They invited and took me for my first ride with the club. I was still not well versed with my bike but my 1st ride was to Ganpatiphule. We left at 2.30 pm as suddenly all were itching to ride that day. We reached at 11.30 that night which was one crazy ride for me as I was new and my headlight was more like a candle light. Since then my riding days as a Thumper had started. My most memorable rides were goa where I meet Rahul Arekar who is now the mod of the club, Ranjit, Guri, Popup, Jackson and many others. Still have the image in my head when ridding out of Goa we rode into the rising sun in a single line all the bulls thumping away in awesome synchronization. Other rides have been numerous but the one which are still fresh in my heart are Goa, Kumbharli Ghats, Tapola, Mahableshwar and RM (Delhi). The bond with the Thumpers have grown and have made many close friends. They are family and brothers on the roads and on rides I have done. I have been given the privilege many a times to lead and tail the pack. Mostly tail the pack if Rahul and Shark are on the ride LOL. The rides will continue and the biker in me gonna live till I breathe.